This is about giant robots with silly names, being moe for Amuro, Char's intense masculinity, and hating Quess! Click [HERE] to join in the hate. you dont like the writer yet you expected this movie to be good? I always thought Char's counterattack wasn't that great, but I never really thought about why it was. I think you guys really hit the nail on the head with this one. I guess one good thing about Gundam TV series was establishment. You knew why things were happening. They never seemed to mind dragging out a whole episode to establish one thing. In Zeta, Kamile can't loose his father and mother, and have Emma defect in one episode. It takes three... when it really needed to take one. But remove the establishment, the explanation of why things are happening... and you get Char's Counterattack. Everyone gets 3 or 4 lines then dies or goes off-screen. OK, main characters get about 15 minutes. 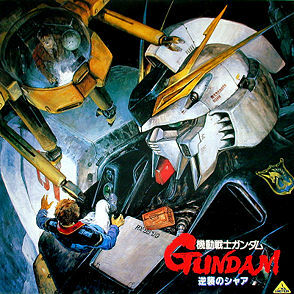 But if you squished Gundam into a movie, you get this. It's the logical outcome. So why is everybody surprised? Clearly Char and Amuro have issues with their Moms! Being reminded of having saw this film when Cartoon Network had it on as part of some Toonami movie presentation years back, seeing the ending and going "That's It? What a dumb ending!" You build up all that potential and it's wasted.